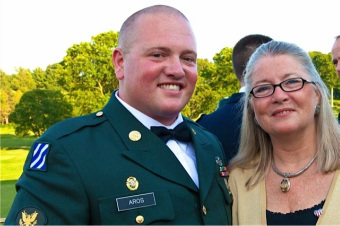 Bonds of Courage (formerly called “Summit Supports Our Troops”) was founded by Christine Truhe, PsyD after her son received orders for his first deployment to Iraq. As a loving mother and psychologist, she understood the tremendous impact his deployment would have on him and his wife, on her as his mother, and on the rest of the people who know and love him. Upon recognizing that civilians were generally unaware that their neighbors were serving their country with many in harms way, she quickly launched a major community-wide effort. On May 31, 2004, the organization she created was introduced to the community at the town Memorial Day observance. Since that day, individuals, families and businesses in Summit and surrounding areas have volunteered time and supplies and contributed financial resources to help the organization better serve our Troops. The organization’s growth took another major step when Chris made contact with officials at Ft. Benning in Georgia, where her son was stationed, to see how her group could assist the Army in serving soldiers and veterans of the wars in Iraq and Afghanistan. Much to her surprise, Colonel Scott Spellmon and his wife, Mrs. Sharise Spellmon, eagerly welcomed her mission, thus beginning a relationship of mutual support that continues to the present day. Within just a few months of its inception, the Summit, NJ community provided enough resources to enable Bonds of Courage to provide its first major shipment of 500 Freedom Boxes to the 3rd Brigade Special Troops Battalion, 3rd Infantry Division at Ft. Benning. Upon arrival of the shipment, Colonel Spellmon awarded Chris the “Patriotic Civilian Award” from the Department of the Army. Bonds of Courage has since developed relationships with all branches of the military who, each in turn, have supported, educated and encouraged Bonds of Courage to continue its service to the troops, to veterans, and to military families.